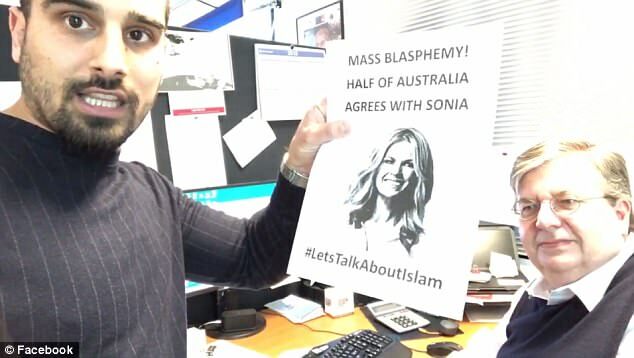 An activist who was refused service at Officeworks for attempting to print out anti-Islamic posters has hit out at the chain store, claiming his right to freedom of speech has been violated. 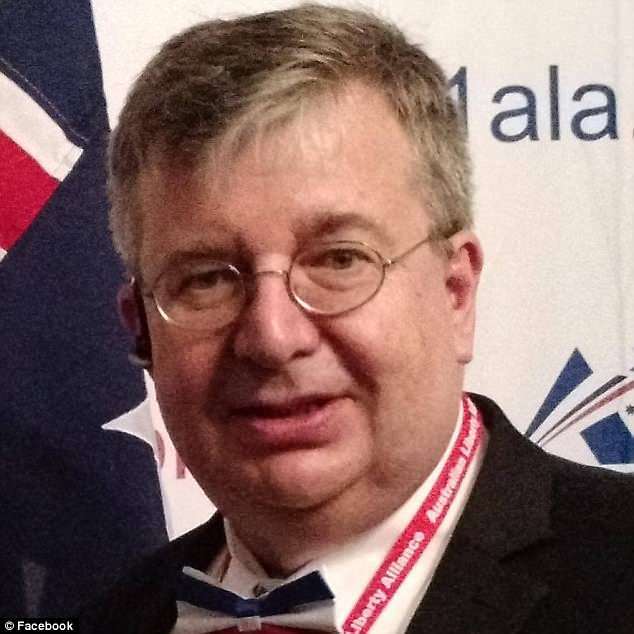 Avi Yemini and Ralf Schumann of the Australian Liberty Alliance are both regular customers at the Officeworks branch in South Melbourne: printing and laminating any materials there that are too large to print in their own office. Like, for example, an armful of flyers for an upcoming rally they’ve organised in support of free speech and defense of Sonia Kruger. ‘We went there this afternoon like we have for 3 or 4 years,’ Mr Schumann told Daily Mail Australia. ‘The chap on the counter puts the USB stick in like he always does, gets the first screen up like he always does – and calls his young manager over. One of the posters declares that: ‘Criticising perverse ideologies is not racial discrimination. Islam does not equal race’. ‘So I wrote a brief email to the manager to tell him that his store policy does not override federal or state anti-discrimination laws,’ said Mr Schumann. Mr Schumann insists that, in this case, he’s the one who is the victim of discrimination. ‘Absolutely I’ve been discriminated against,’ he declared. 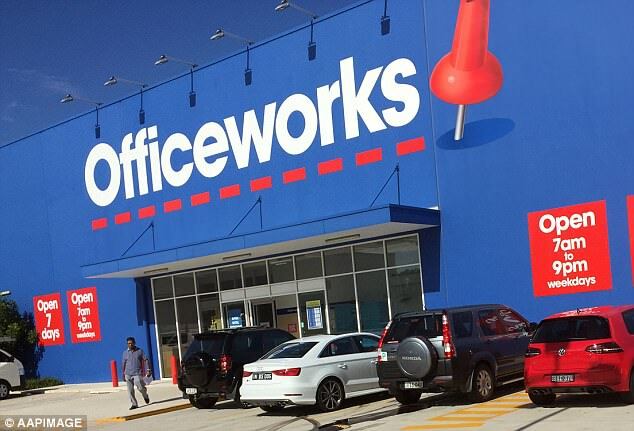 Officeworks refused to comment when approached by Daily Mail Australia. The company has, however, since posted a comment on a Facebook video that Mr Yemini uploaded on Friday. 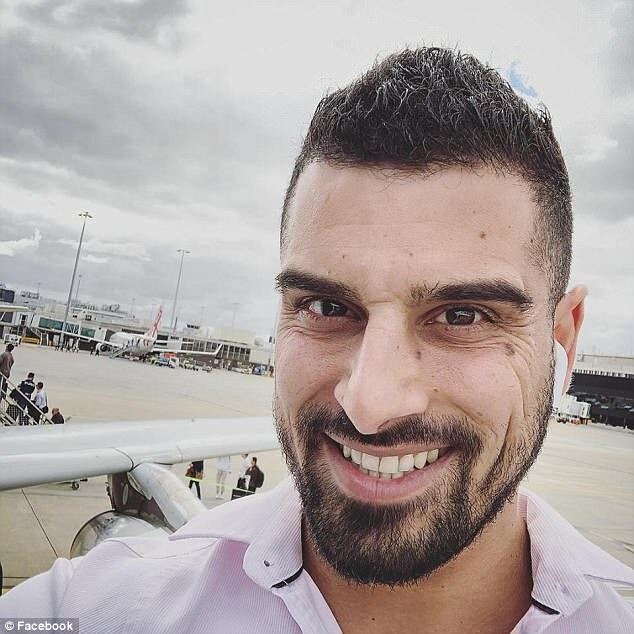 In the video, Mr Yemini trumpets to his 168,000 followers how the chain store has disrespected his right to freedom of speech. 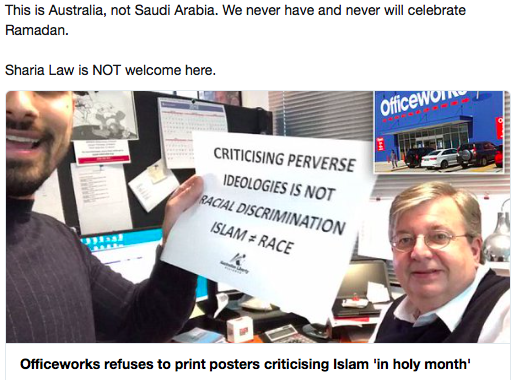 ‘At Officeworks, we respect our customers’ right to free speech,’ the company’s comment reads. ‘However our policy prohibits customers from printing any materials which may be threatening, abusive or incite hatred on any person. Mr Yemini further claims that the office supplies chain’s refusal to print the posters is in violation of consumer law. ‘If they have a complaint under racial discrimination they can refuse it, but this wasn’t racial discrimination,’ he said. Isdamn is not a race! The flyer is accurate. Isdamn is a predatory way of life that enslaves people of all races although it originated in Arabia. Ayaan Hirsi Ali was born Black and Muslim. She is no longer Muslim but she is still Black! If that offends ‘slimes, piss on them! Questioning, criticizing, mocking & resisting Isdamn is a natural right even if it offends Muslims. Sharing factual information about Islam & ‘slimes is a natural right even if that information makes ‘slimes objects of hatred. Genocidal terrorists deserve hate & condemnation! !